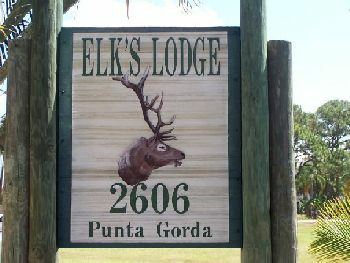 Elks Lodges in Punta Gorda brings so much more to the community than just a building, golf course or pool. It’s are places where neighbors come together, families share meals, and children grow up. Lounge/Bar opens Monday – Saturday at 11 AM and Sunday at Noon. A light lunch is available in Bar Monday and Saturday, full lunch menu is available Tuesday thru Friday. Peel and eat shrimp available in the lounge on Sundays. The name “Eagle’s Nest” comes from the early 1900’s when our Lodge was a famous hunting and fishing lodge. Many tables provide a beautiful panoramic view of the Peace River and upper Charlotte Harbor. Cabin Rentals are available to Elk’s and their Guest’s by the day, week or month. Cabins include kitchens, bathrooms and sleeping facilities for up to 4 people. To view more information, click NEW Cabin Rental Rates and Cabin Area Layout . The dock is 550 ft long and was completely rebuilt in 2003 after the old dock was destroyed by a “No Name” storm in 2001. During Hurricane Charley the dock remained in place but took on a pronounced “serpent” appearance and had to be re-set. The depth of the water at the end of the dock varies from less than 2 ft. at very low tide to more than 4 ft. at high tide. The depth decreases gradually as you move closer in toward the seawall. Members and guest are allowed to fish from the dock and tie up their boats for day events at the lodge. 11A.M – 2P.M. & Saturday from 11a.m.-2p.m., lite lunch is served on Monday’s (cold sandwiches and soup). Chicken Nite is every Monday from 4:00-8:00P.M. Chicken Dinner for $8 (all volunteer event), the tiki bar opens at 4p.m. We are… A fraternal order with nearly a million members and a 141-year history, a network of more than 2000 lodges in communities all over the country, a generous charitable foundation that each year gives millions in scholarships, an inspiration to youth, a friend to veterans and more. The essence of the Elks, our focus and our purpose. The Elks are involved in a wide variety of programs, from scholarships to drug education to Veterans Services. Check out our more than 2,100 local lodges. Contact and submission information from the Elks Magazine, plus the Table of Contents from our most recent issues. Some essays on the History of the Order. So you want to join the Elks? Click here to find out how.